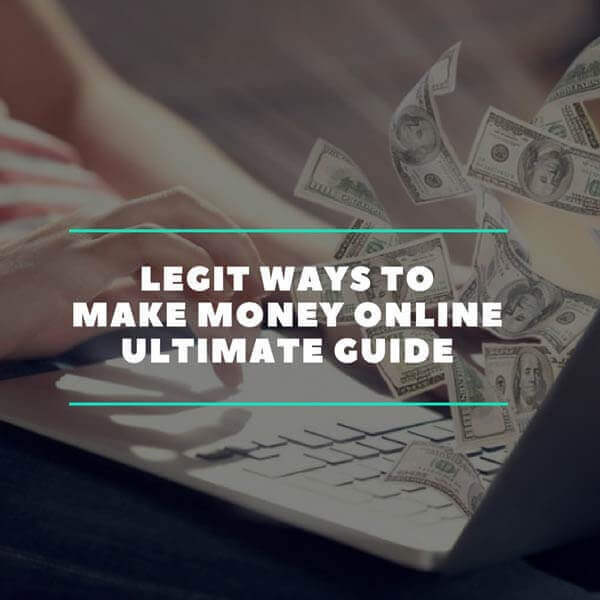 Legit Ways to Make Money Online in 2019 - The Ultimate Guide. There are literally tens of thousands of ways to make money online however like anything on the internet finding high-quality information on how can lead you down a rabbit hole with many traps and inaccurate or outdated information along the way. The purpose of this guide is to only outline the legitimate ways of making a full time or part time income on the internet in 2019. Everything in this guide is something I have either personally done myself or a colleague or client of mine has experience in. After working full time online for 13 years it is easy to have built up a wealth of experience in different niches, especially since my main role during this time has been as a web designer and digital marketing consultant. eCommerce is more of a genre these days with many different ways you can begin to sell products online. When most people think of eCommerce they initially think of setting up their own website, and while this is still one of the best options there are others. The most typical way of running an eCommerce business is to build your own eCommerce website and begin selling a product. There are lots of affordable ways to do this by getting a domain name for $6 or so from Namecheap or GoDaddy, hosting for $60 per year and then installing WordPress and WooCommerce and have your own online store created in a matter of a few hours. Additionally, popular services like Shopify make the process even easier for newbies who want to set up shop online. Shopify also has some other excellent features like the ability to sell through Facebook Messenger, import products from AliExpress using the Oberlo plugin and much more. For the ultimate professional option you can use Magento, however, the setup costs are extortionate and I seldom meed store owners that require any of the bespoke features and capabilities available with this high-end eCommerce software. A tool many are still unaware of FBA also known as Fulfillment by Amazon is an innovative shipping and warehousing solution that allows you to buy goods from anywhere in the world like China, for example, using Alibaba.com and send your products to Amazon's warehouses. Amazon then handles all of your shipping to customers for you, freeing you up to be anywhere in the world running a physical goods retail company without any warehousing. This is excellent because it reduces your risk by taking away the need for expensive warehousing space, and Amazons ability to ship quickly to customers is impossible to compete with. Keep your customers happy and they will keep coming back. There are many courses on how you can learn to sell Private Label products on Amazon or on your own website using Amazons FBA platform to manage all of your fulfilment. Want to learn more? Read our comprehensive Beginners guide to selling with Amazon FBA. This was one of the first ways I got into internet marketing and making an income online. To put it simply, affiliate marketing involves you being a middleman (or women) on the internet promoting products. While I am a big supporter of affiliate marketing and see it as a perfectly moral form of marketing it has earned a bad reputation among some circles as a result of certain unscrupulous companies using this method to growth hack their businesses and scale up and also because it is often associated with multi-level marketing (MLM) which uses the same concept but takes it one step further by adding multiple tiers and often a shoddy product. The kind of affiliate marketing that is respectable and sustainable is promoting high-quality products and services you yourself have tried and/or use regularly. This way you can say wholeheartedly that the product you are recommending and earning a commission for offers good value for money and solves a problem and isn't just some get-rich-quick business model you are trying to sign others up for. You can use affiliate marketing in many ways, on your YouTube channel, in your blog articles, on social media or by building your own educational website on a specific subject with tactically placed and appropriate product links throughout. A great affiliate network to check some offers on is MaxBounty, Webgains is also a great option but the best affiliate network will depend on the vendors/merchants you wish to promote. Expect an article on all of the best affiliate networks coming soon. Want to learn more about affiliate marketing? We have a detailed guide on how to start affiliate marketing. Also, find out The Best Affiliate Programs for Bloggers. Dropshipping might be a lot more competitive than it was 5 or 10 years ago, however, competition can be a good thing, with competition comes improved tools and I can 100% vouch for the fact that dropshipping in today's age is a LOT easier to set up, automate and manage than it was just half a decade ago. Now you can use tools like Shopify, Oberlo and Aliexpress to have a dropshipping website setup in a matter of hours, or maybe a day or so if it's your first time. What is dropshipping? This basically involves you selling other websites inventory on your website, you take the payment and set the price you want to sell for, you then send the supplier their costs and they "dropship" the product directly to your customer so you don't have to handle the goods and waste time reposting. This allows you to save massively as you don't need to buy any stock. The main flaw with the dropshipping model can be keeping repeat customers because when you dropship directly from the supplier and the supplier is the other side of the world, your delivery times will be 1-3 weeks and not the 2-5 working days most people in developed nations have become accustomed to. One of the easiest ways to monetize your website, blog or social following is to create merchandise you can sell on your online store. If you have a popular blog, Instagram or YouTube channel why not print your brand on a wide range of different goods from T-shirts, hoodies, skirts, and hats to iPhone cases, Pillows and other household items. This is a low-risk way of creating a product as there are no upfront costs and you don't have to buy bulk and store your own inventory, welcome to the world of print-on-demand. You can visit our full guide on creating merchandise at create merchandise online guide. A popular way to make money online that has been around since the dawn of the internet is creating and selling an info product. This could be delivered in one or more different formats depending on your skill set and what you think works for the consumer. Examples of these include. You can create your own educational course on any subject you are equipped to teach using tools like Udemy, Teachable or by building your own learning management system (LMS) with WordPress and a plugin called LearnDash. You can create free content and premium content behind a paywall and charge customers either a one-off course fee or go for the subscription membership model. Your course can include text, podcasts, videos and quizzes to add more depth and value. There are even courses on how to create courses! eBooks are another favourite in the information product niche as they are easy to produce and even easier to distribute, of course writing a solid eBook isn't easy and takes some planning and a thorough understanding of the subject matter you plan to teach or talk about. Remember not to be a charlatan and only create a product you know will be of high quality. This is a competitive space and there are some eBooks covering lots of subjects. The tip here is to niche down and consider picking a sub-niche, something that is easier to make an impact on. Once you have written your book, check this eCover Maker for designing your book covers in 2D and 3D. If you enjoy building blogs and websites, populating them with content or hiring a team of writers to help and you are good at it, you can make a very tidy income just building websites to a certain point where they are monetized and making money and then take them to a website like Empire Flippers, Flippa or the Warrior forums. Take a look at some of these websites and see what some fairly small websites are selling for. You can even buy and sell domains without a website attached on some of these websites but this is a dying art and also there are some moral questions surrounding domain squatting, at least if you do it excessively. Perhaps a market that has become a little saturated in the past few years however if you have a novel idea for a new app for smartphones like running iOS, Android or the Windows mobile platform then there are a heap of case studies and success stories of people making money launching their own apps and games. Heard of Angry Bird? Flappy Bird? and we haven't even left the massive niche of bird-related tapping games yet! There are hundreds of courses online that you can use to teach yourself how to make your first app and maybe build a career freelancing with your new app building talents to create a dual income! Two birds one stone! Pun intended! Isn't it always! If you are more into desktop and multi-device tools and have an idea then why not consider creating your own piece of software, or if you don't have the desire to learn how to program C+ and other lower level languages then head over to Upwork and find yourself some professionals that are interested in helping you achieve your vision. Software has the ability of easy distribution given all software can be digitally delivered with no physical product being required. The profits in this sector are insane, I should know since I am often paid as much as 50% affiliate commission for recommending software I use to colleagues, friends and readers of my websites. The internet is a fantastic place to find freelance opportunities. Remote working has become very popular over the years and the number of people who provide a service as a freelancer from their own home or a remote location is still growing. If you have a skill that applies to freelancing and can be done remotely then this could be for you. Some great examples of popular freelancing opportunities online include. If you are a good writer and salesperson then you might be interested to know that some of the most talented copywriters on Upwork.com like Danny Margulies of FreelancetoWin earn $250+ per hour for writing sales copy for clients. Copywriting isn't always for articles either, sometimes clients require sales copy for a whole host of different materials and mediums like presentations, videos or advertisements. Web design is one of the most interesting and dynamic jobs available to anyone into internet, design and computers. If you like the idea of programming and also enjoy design then learning to become a web designer or developer whether it be front-end or back-end could be for you. The internet is ever evolving and as a result, websites need to constantly change and improve to keep pace, this provides a constant stream of work while keeping you on your toes and ensuring you are at the cutting edge of web technology and trends. Using tools like WordPress can rapidly reduce the learning curve and courses from Treehouse and CodeAcademy make learning the basics of code as easy as 1st-grade mathematics. You can then find work on a plethora of websites like Upwork, Guru, Freelancer & a new one on my radar called ClearVoice which I am hearing good things about. Do you have a keen eye for details? If you are good at spelling, grammar and have a vast lexicon to draw from then you might find proofreading to be a profitable venture. The sheer amount of content that is being written and published daily online requires editors and proofreaders to ensure reputable publications, writers and websites don't appear as professional as possible. You can find this kind of work on freelance job websites like Upwork, Guru & Freelancer as well as by signing up with agencies which take on this work en masse from publishers to pass on to remote workers. Another approach is to contact website owners when you spot mistakes and make them an offer to proofread their website and explain the benefits, like not losing credibility with new readers. If you have good word processing skills, know how to do online research, send emails and do other tasks to take the pressure off other busy businesses and individuals online then being a virtual assistant can be very rewarding. Virtual assistants can be required to perform a wide range of tasks and while some will only be required to know the basics of word processing, emails and gathering information, booking tickets and organizing a schedule others may be required to manage website tasks, social media and much more. The great thing about being a virtual assistant is that if you find the right person or people to work for they may be willing to take you on and teach you different tasks and responsibilities over time, which in turn expands your skill set and can bring more opportunities or make you more employable to others in the future, not to mention it's also a great way to find a mentor. If you are confident and comfortable recording your own voice then voice-over work can be a great way to make money. While there are a lot of people offering this service on low-cost freelancer websites like Fiverr, if you are good you can really carve out a niche for yourself. People who have a diverse tonality and are able to do both professional voices for companies and fun character voices for entertainment projects can really cash in with some networking. Who knows maybe your work could lead to bigger things doing voice-overs in animations, film and TV advertisements? The sky is the limit! Are you bilingual or trilingual? This is one of the best skills to have and can allow you to both sell translation services and also launch websites and blogs in different languages where you may be able to tap into a market that many English only speaking folk aren't able to easily enter and navigate due to the language barrier. Companies need their websites, documentation, advertising and other mediums translated into many languages. Google translate is not a professional alternative, at least not for articles and complex subjects. If you learn any skill that is beneficial to either individuals or businesses and can be operated remotely (for the most part) then you can easily start a consultancy online and work from home. Some businesses may require you to do call outs to visit customers in your area and others might not require you to do any face to face in person interactions with your end customer. You can use the internet as your medium to reach people locally and globally through search engine optimization, social media marketing, and pay per click (PPC) advertising to bring you more enquiries and customers. I know this sounds obvious but to my astonishment, even in 2019, I am still meeting "professionals" without a website or any web presence whatsoever. Web 2.0 brought with it a more mature and developed social internet and gave birth to the Facebooks and Twitters of the world with a switch from the static web to a more dynamic and user-generated content based internet. With this change came hundreds of thousands of new businesses, jobs and opportunities both directly in this new industry or as a result of it. If you enjoy social media and like the idea of managing social media campaigns for other individuals and companies then perfecting your skills on various social networking platforms can be a great career and can lead to you starting your own agency eventually. With so many different social networks focussing on different mediums and formats you can specialize in one rather than all. For example, you could be a Snapchat marketing specialist rather than going for the big and broad market of social media marketing and really study the best ways to growth hack for brands using this one medium that has an emphasis on video content, innovative filters and is aimed at a younger userbase of gen-z and millennials. You can offer a long list of services in this business from social media automation and management, involving scheduling posts and managing campaigns and social PPC budgets to creating the designs of profiles, images and short-form video content. If you have built a large following on one or more social networks or find it easy to do so and replicate this success then you could be making a sizeable income as a social media influencer or micro-influencer by promoting products, services, and brands to your following. Instagram really took this to a new level over the past few years though people have been selling space on their social feed for years with Twitter being one of the best places in the past that have waned a little in market dominance since however, one thing about social media is that certain circles and niches tend to prefer a specific social network. Reddit is big for the tech fans, Instagram is great for the masses and anything lifestyle orientated, the world of cryptocurrency is most active on Reddit and Twitter for example, while you will find brands in high fashion gravitating more toward Instagram. So you have to choose your weapons wisely to position yourself for the right market. 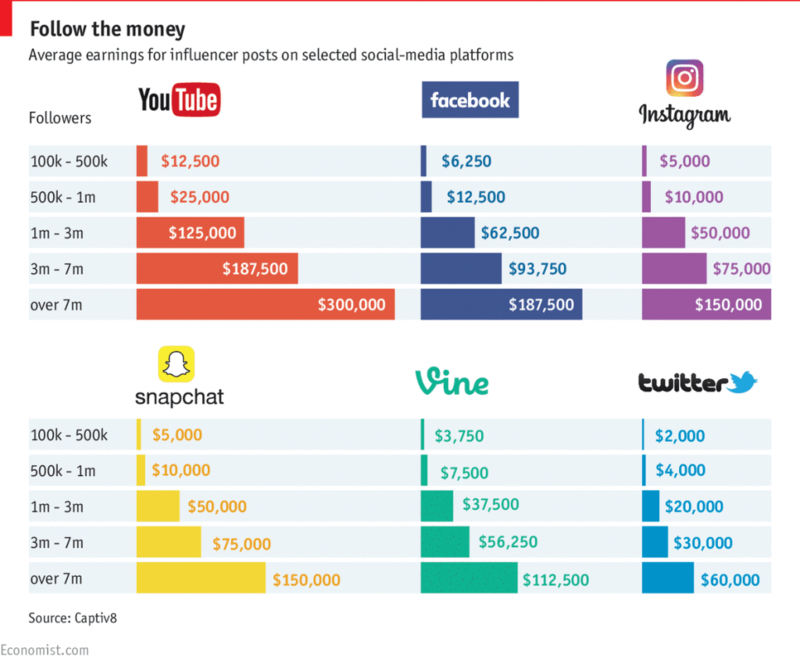 YouTube has also been a fantastic incubator for influencers, people like Casey Neistat and others get sent tonnes of free stuff and paid sponsorships purely because they have so many people following them. Though you don't need a follower count like Casey to start making some good money if you choose a good niche where you can offer value. Check out influencer and micro influencer services like FameBit who were recently acquired by Google and provide tools to connect influencers with brands. A bit passe to some by now I am sure, but you can still make a great income from blogging if you are efficient, self-motivating and a decent writer. You can set up your own blog either on your own domain using WordPress or another content management system (CMS) or you can just start a blog on a public blogging service like Medium, or WordPress.com. Once you have built up a following and are gaining traffic you can begin to gradually monetize that traffic through various means. Another way to earn money as a blogger is to ghostwrite articles and contribute guest posts for other websites and blogs that are successful enough to pay their contributors. Take risks, offer free articles to get your foot in the door and build your authority in the meantime and reap the rewards later. Starting a blog has never been easier and it's likely the easiest online platform to build, ideal for beginners but still suitable for experts looking to build a niche or authority site. To monetize your own blog you could include advertising, sponsored posts or tie affiliate links to products you are reviewing or recommending. Podcasts have really taken the internet by storm over the past 10 to 15 years despite having it's roots in the 1980's it really began to take off in 2004 and today there are hundreds of thousands of podcasts (originally known as audioblogs) that are streamed online at little to no cost to both producer or listener, a real step forward from the days of internet and bandwidth license monopolies and another big triumph for the internet. For me, Podcasts took over thanks to people like Ricky Gervais, Adam Corolla, Joe Rogan, Tim Ferris and others. The great thing about starting a podcast is if you are camera shy and don't like to write but still have a voice and something to say then this could be the medium for you. There are also podcasters that also broadcast audio and video but audio-only podcasts are more commonplace. One reason so many people enjoy podcasts and the reason I find them so useful is that you can listen to podcasts and learn or laugh without having to pay complete attention since you only need to listen, this is ideal while driving, working out or while at work provided you work alone or can wear earphones. As mentioned above, YouTube is a fantastic place to produce content and build a following online that can ultimately lead to your own online business. If you aren't camera shy, know how to record and edit video or have a willingness to learn then creating your own television show has never been easier. Create a YouTube channel, whip out a camera or webcam and get started. You can edit your footage together using YouTube's built-in video editing suite or you can buy something more professional like Adobe Premiere. We wrote an article on the best video tools that you can check out at The Ultimate Video Marketing Toolkit. The best way to start making money is to build a large following and pick a niche that can be monetized with product reviews and other related content. It also helps if the subject matter is likely to attract YouTube ads so you can earn a good portion of revenue share once you reach the required view total view count to start earning from your views. A great example of a YouTube channel could is Linus Tech Tips who despite not being Casey Neistat or Pewdiepie famous still has a cool 4.7 million YouTube subscribers to his channel where he reviews everything about the latest tech products. One of the biggest innovations since the internet is what is called "the internet of Money" or "digital cash". Bitcoin was the first of many cryptocurrencies, tokenized projects and smart contracts that are decentralized and run on blockchain technology using public ledgers to offer complete transparency or in the case of privacy coins, zero transparency and complete anonymity. This new technology and form of money are changing the way the world works and stands to be the biggest disrupting force we have witnessed since the advent of the internet itself! So how do you make money from this? By being an early adopter and investing before it's too late. Don't think because Bitcoin and some alternative projects have already had a good run that they are going to slow down anytime soon. You can invest in crypto and hold or as they say in the industry "HODL" which is short for Hold on for Dear Life or you can trade different coins and speculate on the prices daily, weekly or whenever is convenient for you. A lot of people have made millions from cryptocurrency and even more, have made moderate wealth, one thing is for sure though, many more millionaires are being made every week in this fast-paced space. Read this guide on ways to make money with cryptocurrencies. To put it simply retail arbitrage consists of buying a product at one retail outlet and then selling it on another for a profit. This is by no means a new concept however over the past few years thanks to websites like eBay, Amazon and other online marketplaces people have been able to make a full time hustle out of arbitraging the price difference between websites and brick and mortar websites. Making it even easier you can go to your local stores with your smartphone and use the eBay or Amazon apps or your browser to quickly find out the going prices of products online. A great example of this is finding designer sunglasses in shops like TJ Maxx and if they have multiple pairs and the price is much better on eBay, buying them up to arbitrage online. If you can buy multiples of the same product you can make more money as you only need to write one online listing which saves a lot of time. Ever heard of Nasty Gal founder Sophia Amoruso from GirlBoss fame? While it may not be around anymore at its heydey Sophia was buying vintage clothes from thrift stores and selling them for a fortune online and eventually becoming a millionaire. This is by no means a long-term and sustainable means of making an income online, however, it's a great short-term way to free up some cash and also a great way to gather enough money together to invest in a new business opportunity online or buy a course to teach yourself a new skill. It depends on your perspective but most people have hundreds of dollars worth of material items they really don't need and your money could be working much harder for you if invested elsewhere. Websites like eBay and Craigslist are longtime favourites for those looking to sell some unused items although new websites and apps like Shpock have also entered the space in the past few years offering an extremely user-friendly approach for those less tech savvy. Another area that can yield some good results is using matched betting offers that most bookmakers use to encourage new sign ups. 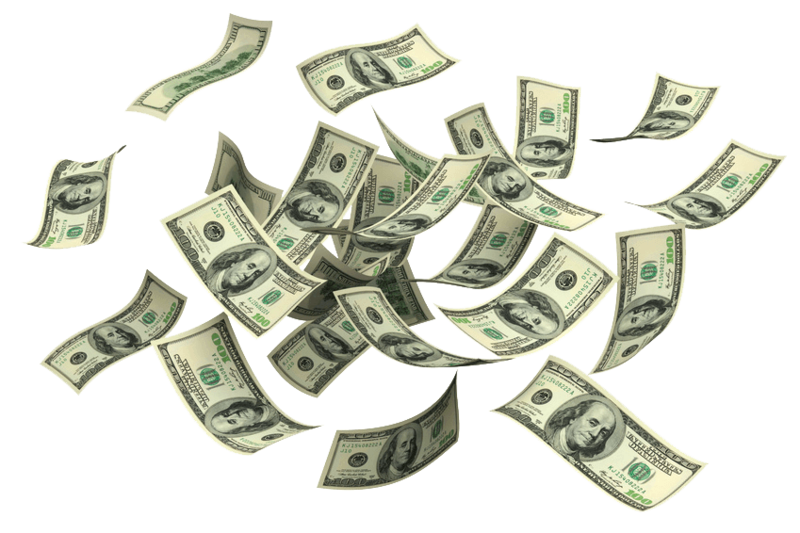 If you hedge your bets and have free bonus money it's easy to make some easy cash. Placing back bets on a bookmakers website and then a lay bet on a betting exchange like Betfair. Read our Guide to Matched Betting to learn more about this betting technique. If you want to think outside of the box take a look at some of the interesting, unique and obscure services people are offering on Fiverr. One example was a Jamaican Rastafarian who was offering to walk down to the beach, write your partners name in the sand and record a video for you to send to your loved one. A pretty novel and romantic gift and very affordable at around $10 if I recall correctly. One way lots of people are creating a business is by building a private members group or what is also known as Mastermind groups. These can be built in many different ways such as creating a Facebook Group and then inviting people while sharing lots of useful and subject relevant content to that audience encouraging them to engage, discuss and also invite others. A Facebook group with a large userbase with active engagement can be very valuable to many types of business, whether you are affiliate marketing, selling services your own course or eventually charge for access for a premium group. The ability to educate yourself online for free is even more powerful when you apply that to bleeding edge technologies. Here are some examples of industries and subjects that fall into this category that are also current as of 2019 (I will update this next year). Blockchain Technology & Cryptocurrency - Example would be learning how to program Solidity, the programming language used for making ERC-20 tokens and smart contracts for the Ethereum blockchain. Virtual Reality (VR) / Augmented Reality (AR) and Mixed Reality (MR) - Learning Unity which is a virtual reality program could be a way to break into virtual reality development. If you ever wanted to get into gaming, then this is a new playing field that is prime for new MVPs. Artificial Intelligence & Machine Learning - TensorFlow and other tools are being used to crunch big data and perform data analytics. AI and Machine learning are rapidly expanding fields. Chat Bots & Voice Assistants - One of the first consumer-facing AI applications have been the use of Chatbots on Facebook and other social media and communication ecosystems as well as the emergence of Voice assistants and search such as Amazon's Alexa and Google Home. These tools are only getting better and you can like developing apps for voice assistants today to developing smartphone apps 10 years ago, the latter is now very saturated in comparison to voice apps. Here are some tips to stay safe when looking for work online and how to avoid pitfalls and scammers. 1) Always apply the following filter: If it sounds too good to be true, it probably is! This is the number one way to stay safe and avoid FOMO (Fear of missing out). 2) Never pay upfront for any opportunity where you should be the one earning. This could be a Ponzi or a scam. 3) Avoid anything related to multi-level marketing. There is a definitive difference between doing affiliate marketing and building pyramids of people to sell things online under your downline. 4) IF working on providing services as a freelancer, protect yourself, take a 50% deposit so you enter into an equal risk agreement with the customer, and take the final 50% at the end upon delivery of goods. 5) Use Asana.com as a project management tool to help you organize all of your online work opportunities and micromanage your tasks and collaborate with your clients and colleagues. 6) Using Upwork.com to find work and manage client relationships adds additional protection to ensure you don't get ripped off. None of the methods explained in this article will get you rich quick, but don't let that put you off, get rich quick schemes simply do not exist and like anything in life a certain degree of effort and skill is required to succeed. I can say that though from personal experience and from witnessing hundreds of others make a career online and from remote locations in the world that it's perfectly doable for the self-motivators among you! Here are some opportunities you might read on other articles that we don't believe are sustainable. Surveys & Consumer Research - This is a common one among articles on how to make money online but we don't believe this is a sustainable and safe way to consistently make money online and so is a waste of time and not worth exploring unless for pure curiosity and experimentation. We have been there and feel for the time it takes to keep finding surveys and filling them in for small amounts of compensation is not a viable way to earn a living. It might make you some small amounts of money if desperate before Christmas but that's it. Mystery Shopping - We haven't delved into this since it typically involves physically visiting a location to help assess the staff and customer service. While I have done this myself as have friends of mine in the past, the work is sporadic and not purely online so disqualified from this particular article. An internet business or career is just like any other and involves hard work, patience and lots of studying and perseverance. Are you ready to take the red pill? or continue taking the blue pill and continue on in the rat race with your 9-5? YOLO! As with anything on this website I would love to hear your feedback and particularly your experience making money online full time or part time as a side hustle. Anything genuine you think is missing from the list? Hit us up!